As I've gotten older night's in have definitely become more desirable in my eyes. After a long week at work the thought of chilling out before a weekend of jam-packed plans really does float my boat. I always love getting all my bits and bobs ready for my night in - the thought of a pamper session, snacks, pyjamas and a good book to delve into really does help me get through the Friday slogg of work. A bit of girly 'me time' is always top of the list when I have an evening with no plans (and even better... no boyfriend lurking around!). I tend to treat my skin to a fancy face mask and my hair to either a hair mask or a good, thick layer of coconut oil. If I know I'm going to have time to wash my hair the next morning (aka non-gym mornings) I'll always pick the coconut oil, slap it on root to tip and sleep with it on there. I've been using the Protein World Coconut Oil which I always grab when it's on offer at Superdrug which always makes my hair feel fabulous, soft, shiny and definitley a bit healthier! 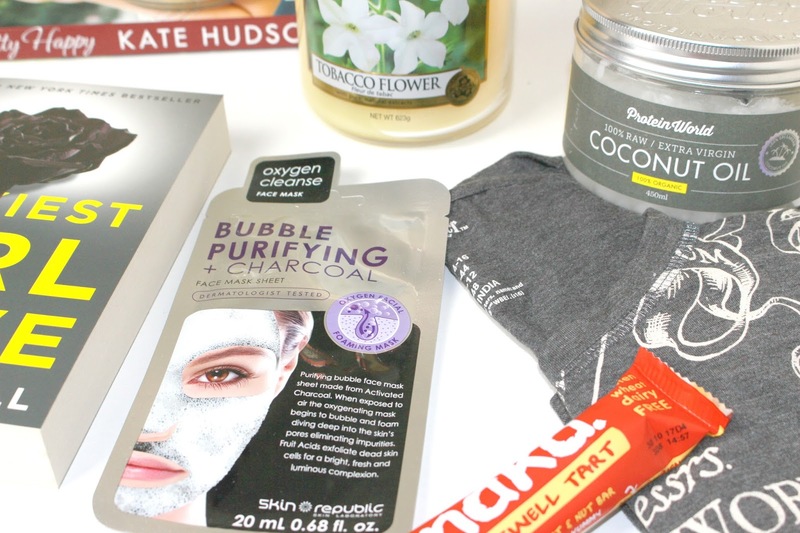 Face masks, as you will know if you've been reading this blog for a while, are my FAVOURITE skincare treat! Forget oils, serums and creams - I'm a sucker for a quick fix face mask, I couldn't even tell you how many I've tried over the years! So when I was offered a fabulous bubble face mask from Skin Republic to try I couldn't say no, a bubble mask?! Well that's new to me! This purifying face sheet mask is made from activated charcoal powder, which 'when applied reacts with the air to create a deep cleansing, exfoliating foam, for a more radiant, clean and clear complexion'! Something I seriously NEEDED to try after a few months of not being overly great to myself or my skin. Sheet masks are always terrifying - you could be a Victoria Secret model and you'd still make someone jump and this one is no exception! In fact this was the weirdest face mask I've ever used BUT my skin is feeling great after 15 minutes of having a bubble face! Check out my Instagram/Twitter for a few hilarious snaps of it in action - thanks Skin Republic! Pyjamas, pyjamas, pyjamas - one of the world's greatest gifts! I pretty much live for taking off my bra and putting on pyjamas at the end of each day. I get a wave of relaxation over me once I've popped on those (most likely Primark) comfy bottoms and oversized top for the evening - and once I've put on my pyjamas that me written off for the day - I won't be leaving the house or doing anything strenuous from then on! Pretty much a given for me. Nights in for me do consist of a lot of green tea though - my absolute favourite drink. Yes, as well as being a total water freak I love green tea, I suppose that is the one perfect thing about my diet, those two things are pretty much the only things I drink unless I'm 'out-out'! As well as tea I, of course, have to have a treaat or two! My favourite thing ever is sweet popcorn with chocolate m&m's poured in (don't judge me and my sugar addiction please) but seeing as I'm trying to be a little healthier I can settle for a Nakd bar. I love these little things.... I still can't quite grasp how they get the flavours so damn on point with each bar, rhubarb and custard, gingerbread, bakewell tart ... they are all so yummy! Candles, one of my greatest loves in life. There's nothing better than filling a room/home with a lovely scent, creating a peaceful and calm atmosphere is essential for a good night in. Recently I have been loving the new Tobacco Flower* candle from Yankee Candles. This is from the new Viva Havana summer collection and is a powerful blend of ginger, cedarwood, bamboo leaf and jasmine! The scent is fresh and actually really reminds me of Summer - I will a little worried with the word Tobacco being in the name but it's nice and sweet and, like all Yankee candles, gives off a strong scent, filling the room with ease! Finally, reading, watching, listening - anything that can take my mind off the washing up in the sink or the shopping list on the fridge screaming at me. Like I said in my previous post I struggle to find time to read even though it's one of my favourite things to do. Time seem to run away from me in the evenings post-gym and dinner I'm half asleep and my eyes can't focus on a TV show let alone text on a page! So I really like to try and delve into a new story when I can, sometimes that's the most exciting time of a book, opening up the crisp first page and starting a new adventure! I've had this book sat on my shelf for months now and I'm determined to finish it this month - it's not the usual genre I read so I'm looking forward to exploring something a little different. I have also made a silent promise to myself that I won't buy any more books until I have read everything I on my book shelf that's yet to be touched.... which is embarrassingly is a fair amount! What sorts of things do you like to do when you have a cosy night in to yourself? 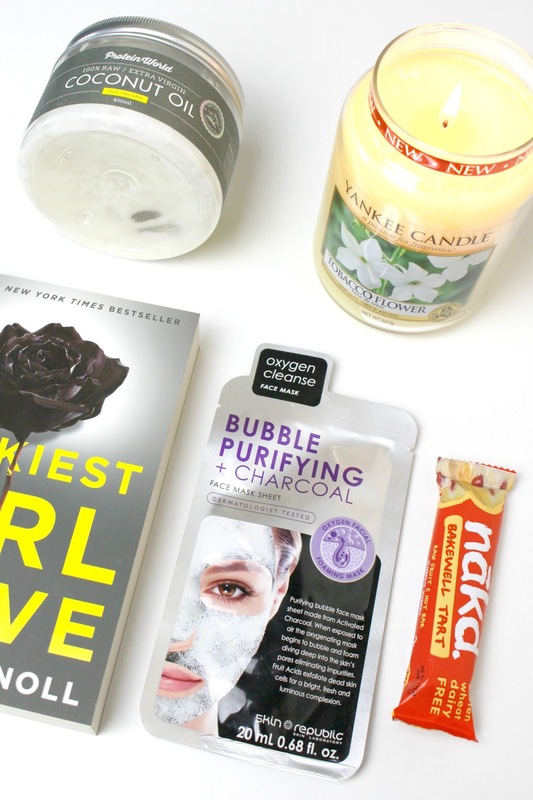 I love a night in to treat and relax myself, I love a good bath, a cuppa tea and a good book! I love nothing better than a quiet night in as well. As a full-time working mum, alone time is something I almost NEVER get, so when I do I love to make the most of it. 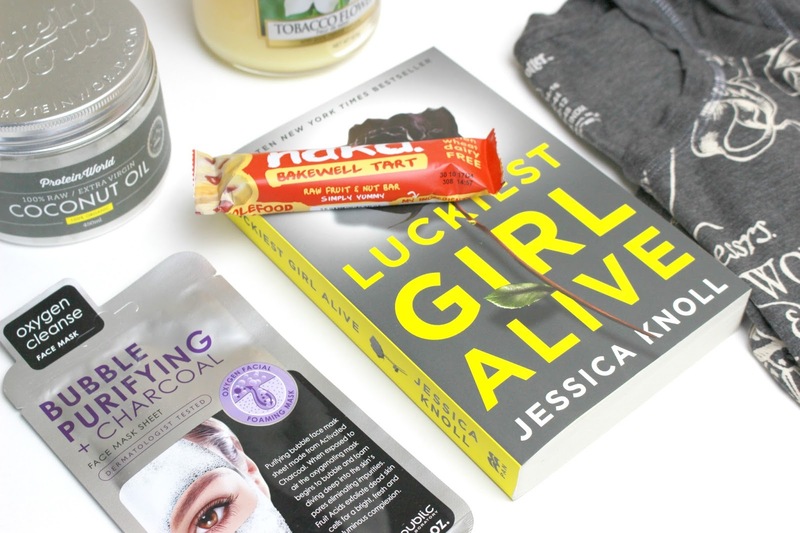 A face mask, Netflix and a chocolate treat sounds like heaven right about now.